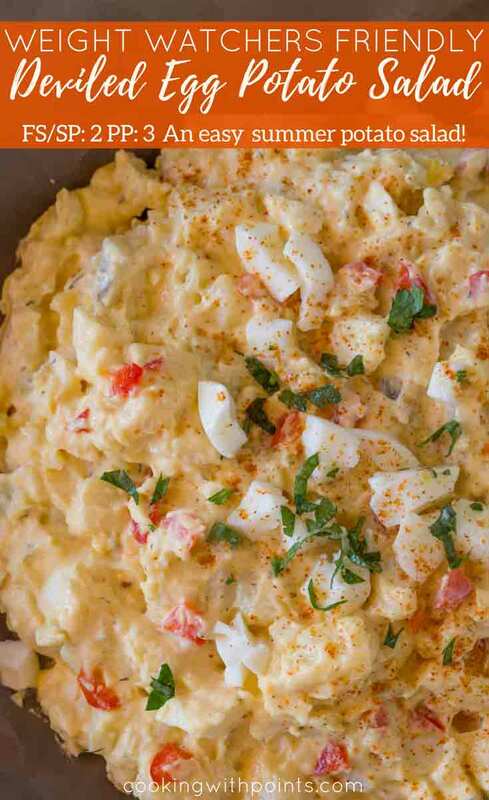 Skinny Deviled Egg Potato Salad lightened up with greek yogurt is a delicious potato salad you can serve during Easter and all summer long. 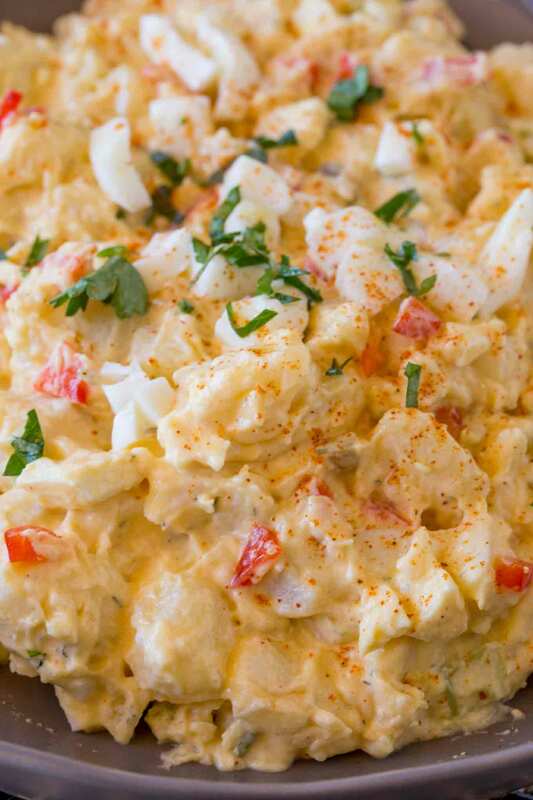 Potato Salad is a staple of spring and summer cooking. As the temperatures are warming up we’re spending more time outside at the grill and we’re enjoying more easy dinners. 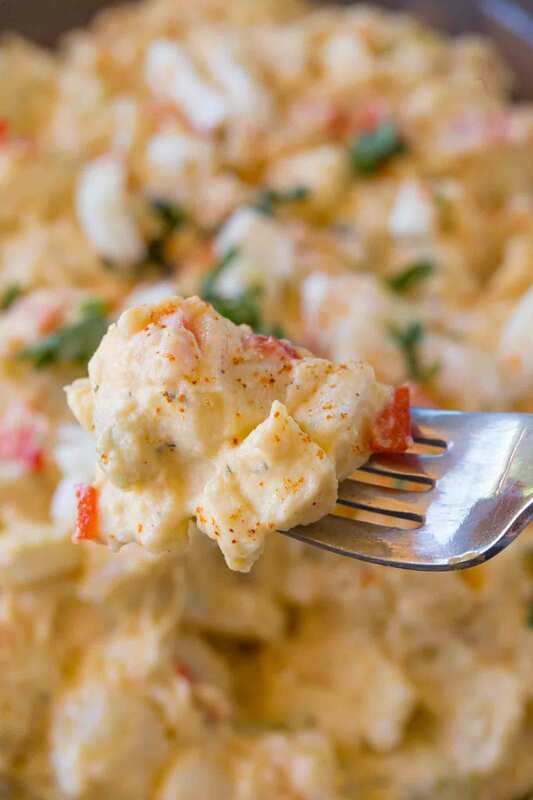 This Skinny Deviled Egg Potato Salad has been a favorite in our house this month and we’ve been eating it with grilled chicken, lean ham steaks and even subbing out the potatoes for additional eggs in sandwiches to make Skinny Deviled Egg Salad Sandwiches. We all know I’m a huge fan of Skinny Deviled Eggs since they were one of the very first recipes on this blog, but this salad takes the flavors up a notch. In fact BOTH recipes would be fantastic additions to your Easter brunch menus. The best part about this potato salad is it has the most indulgent tastes while staying healthy thanks to a few easy swaps. Adding eggs to the salad helps lower the points, swapping out half the mayonnaise for fat free greek yogurt allows us to have a creamy, hearty, potato salad with half the points. On top of that, the cider vinegar, mayonnaise and egg yolks are working in our favor providing rich flavors. If you love the flavors of potato salad and want to kick up the tangy flavors you can add in finely chopped pickles or even just a bit of pickle juice. One of my most recent lunches actually included this Deviled Egg Potato Salad made without potatoes. I kept the rest of the ingredients the same but added in chopped chicken breast I’d roasted off in the oven. I ate it at room temperature while cooking for a client during my lunch break and the flavors were amazing (I did pause for a second and think about the fact I was eating chicken with eggs, but honestly it was SO GOOD I am almost tempted to add that recipe to this blog too! 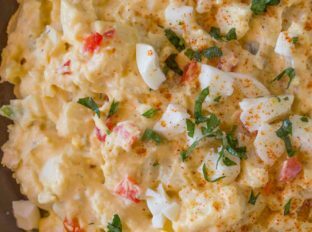 With the flavors of the eggs, mustard and vinegar, this is reminiscent of a southern potato salad. Once tossed letting it cool in the refrigerator for an hour or more will make the flavors even more delicious. You can keep this potato salad for up to three days in the refrigerator. Dutch Oven: I love this cast iron dutch oven and the top of it doubles as a pan. Add the potato chunks to cold water in a large pot and bring to a boil. Cook for 10-15 minutes or until fork tender. 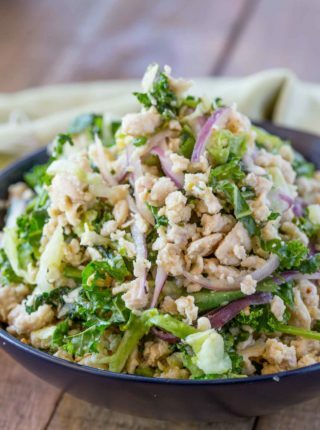 In a large bowl add the celery, green onions, bell pepper, mayonnaise, yogurt, salt, black pepper, mustard and cider vinegar, mixing well. Chop the eggs into large chunks and add to the bowl along with the cooled potatoes. Stir together gently, place into serving bowl and garnish with paprika. My husband would love this! I will have to make it for him! 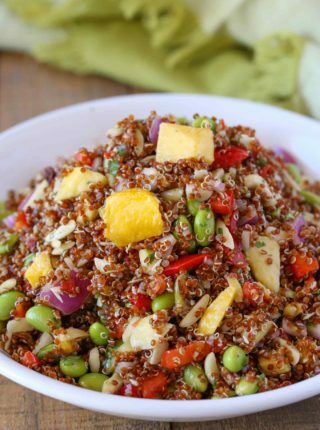 So fantastic for all those potlucks that will be coming up over the next few months! Heck, yeah! 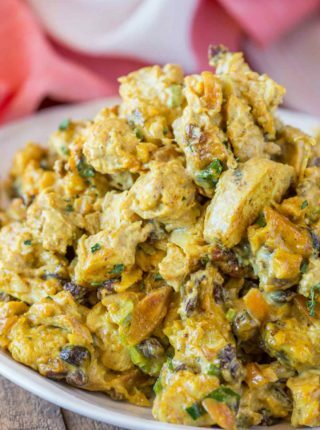 Post the deviled egg chicken salad recipe for us! Sounds incredible! I’m sure I won’t be the only one to ask for it!! oooo I love the idea of a skinny deviled egg!! This sounds incredible!! 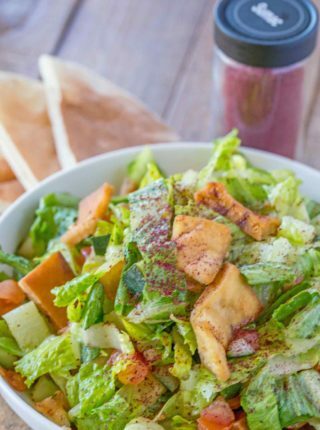 I love potato salads and that looks fantastic! This is making me want to go out and BBQ this week! 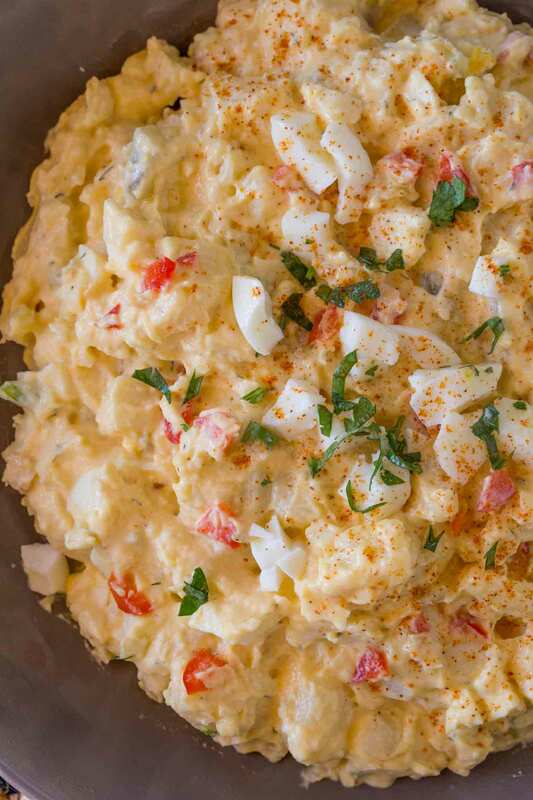 Such an awesome way to make deviled eggs! I need to try this! I made this recipe for Easter dinner. It was delicious and everyone like it. However, I found I didn’t know what a large potato’s size would be. I looked it up on the internet and they said a rule of thumb was between 8 oz. and 12 oz. So….I used a total of 26 oz. of potatoes. When I built the recipe in my WW recipe builder, it came out to 4 Freestyle points. Just thought I’d mention this. So I recalculated, with 26 ounces as a baseline, I show 3 points per serving. I used the recipe builder as I always do but still am not getting four points. I’ve updated to reflect 3 points instead of 2. I think my previous potatoes were not “large” and maybe more medium. I calculated the SmartPoints, and it is 4 SP per serving, not 2. So I recalculated, with 26 ounces as a baseline, I show 3 points per serving. How much weight were you giving the potatoes? I’ve updated to reflect 3 points instead of 2. I think my previous potatoes were not “large” and maybe more medium. Best potato salad I’ve had in years. I will new making this all summer! So glad you enjoyed it, Jess! Hi, what is a serving size in “cups”? Beverly, a serving should be somewhere between a cup and a cup and a half, depending on the size of the potatoes.